Keflavik airport to Reykjavik* should have been simple. After a terrible, sleepless video game drive of aquaplaning and tempting the fuel tank to it’s final drops, we reached Iceland’s capital. The absence of a dark night proved an asset as we scanned street signs for the hotel. We had gotten lost a dozen times trying to navigate the truly un-pronounceable and un-rememberable street names. Follow Snæbraut. If you pass Langholtsvegur, you’ve gone too far. Right onto Kringlumýrabraut, then onto Sundlaugavegur. Oops, we took Laugalækur instead of finding Laugarasvegur. We finally arrived, at about 4am, tempers already fraying between the four of us. The first night was rough, but luckily, we had arrived in one of the coolest, cleanest, safest and most charming cities i’d ever seen. By foot, we located a long shopping street blocked to traffic by colourfully painted bikes serving as gates. Up and down this street, we popped in and out of second-hand clothes stores, souvenir stores, novelty restaurants (anyone for a steak at the Chuck Norris Grill? ), hipster bakery/cafes and CD shops where the owner offered coffees as we listened to headphones. Whether or not this was the ‘tourist area’, I couldn’t tell, but branching off was a grid of quiet suburbs. 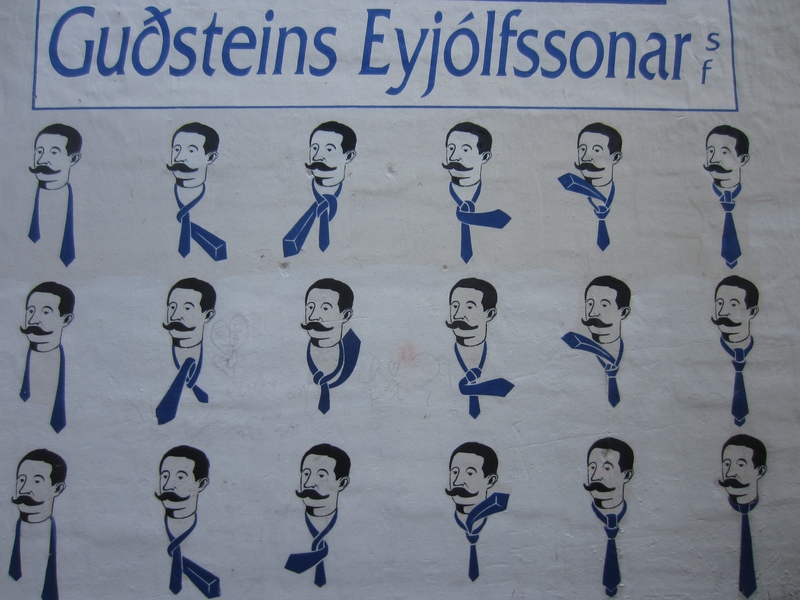 Reykjavik is art. The houses, painted brightly, the canvas. Talented murals of graffiti could be found absolutely everywhere. 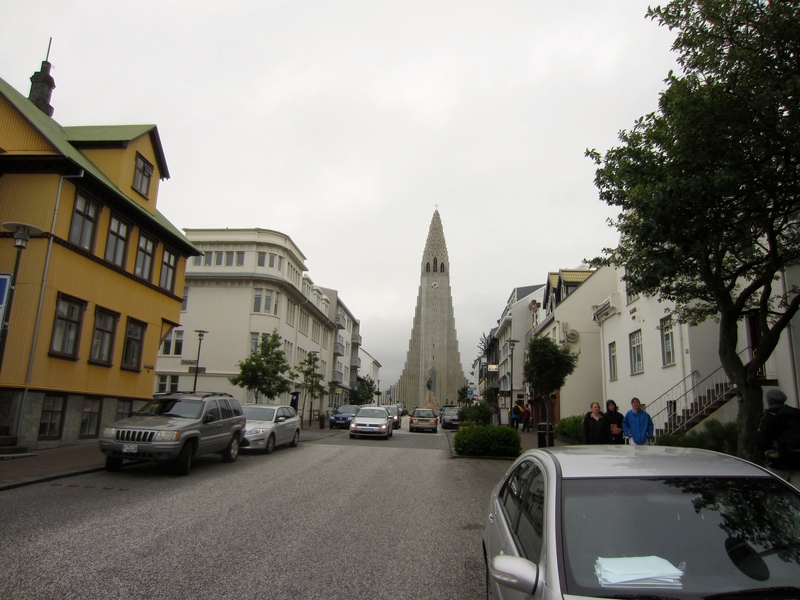 Up the hill stood Hallgrímskirkja, Reykjavik’s eye-catching concrete church, tall and simple like a 1950’s rocket ship, decorated with vertical columns like volcanic basalt rock. 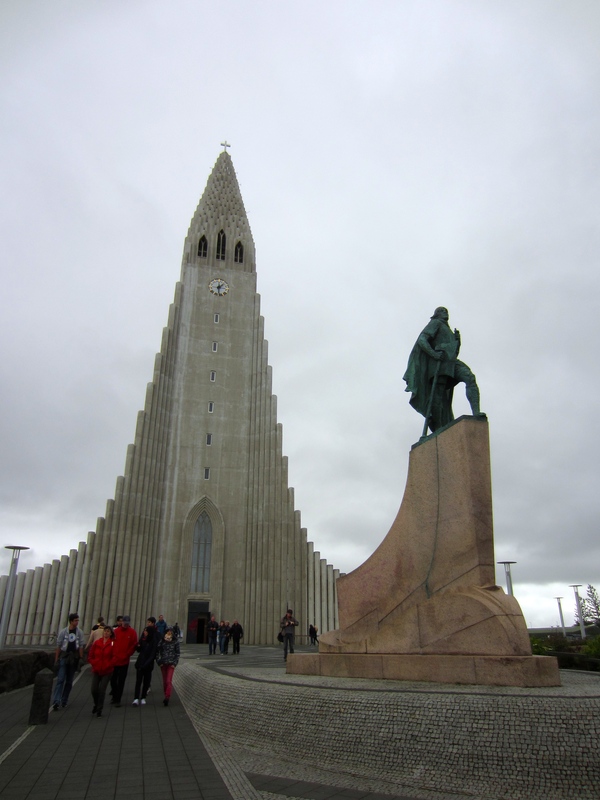 Protecting the church, battle-axe in hand, the statue of Leif Erikson stood watch. This Icelandic Viking explorer is the man who discovered Greenland, and even sailed as far as Canada. 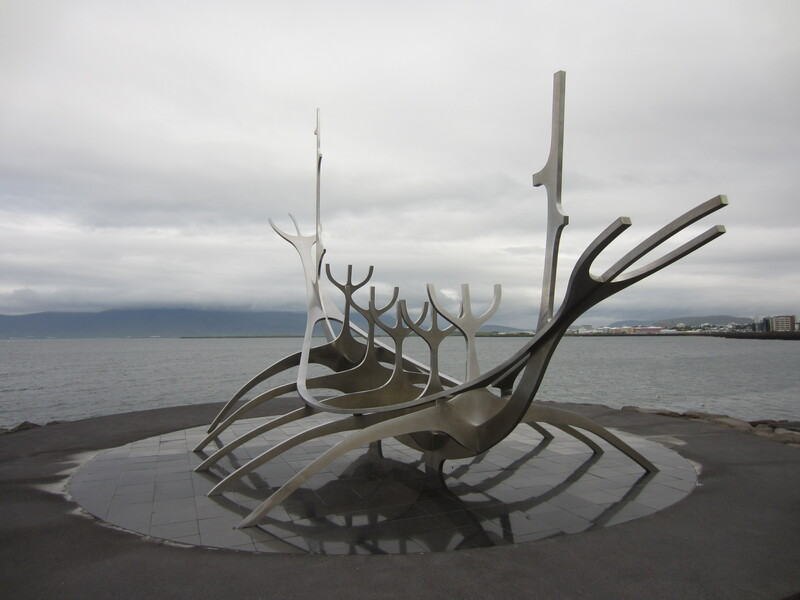 Leif is just the first of many homages to Iceland’s Viking past. 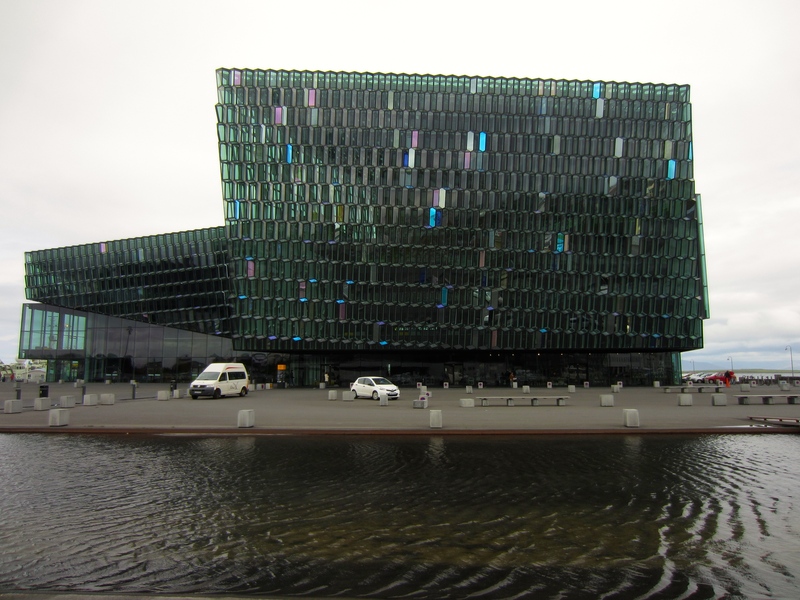 Down by the waterfront, past the square glass beehive of Harpa, the concert hall, clouds hid distant mountains. A past life as a hard, cold fishing port was still in evidence at the old port. Nearby, a skeletal sculpture of a Viking longboat. Stainless steel oars, masts. A prow, stern and rigging reminiscent of a reindeer’s antlers, which I hoped to see out in the country. Tomorrow we would go. I knew that there was a portal in the earth, not even a day from here, which fires boiling water 20 metres into the air. I couldn’t wait to get going. 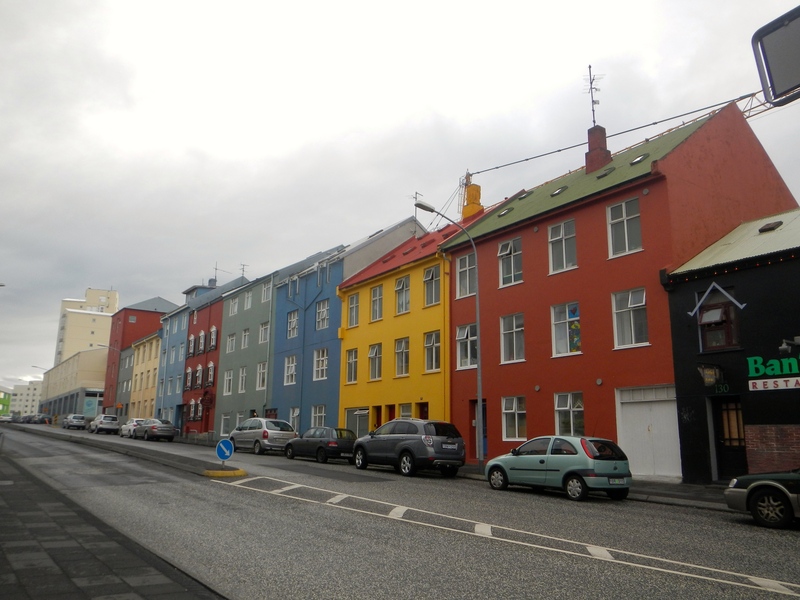 *To pronounce Reykjavik, it’s something like ‘Ray-kya-vik’. I love that mural on the side of the house! That’s so cool there’s so much street art there. 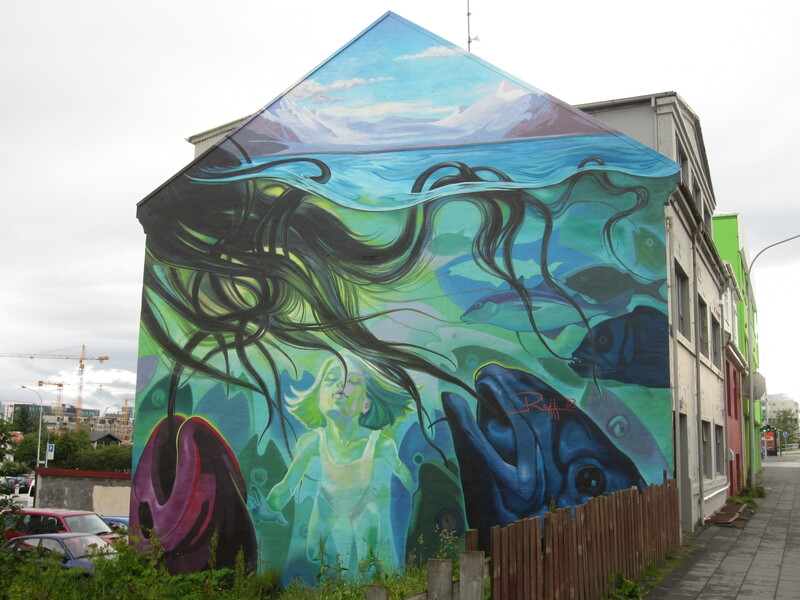 I don’t know a ton about Reykjavik but I guess graffiti isn’t the number one thing that pops into my mind when I think of it. I just wrote a whole post about Bogota graffiti so I’m particularly obsessed with street art right now 🙂 Anyway, I can’t wait to read more about your Iceland adventures! !